Cara the Quarter-Life Cook joins the "Recipe of the Week" team from Big Girls, Small Kitchen, a food and recipe guide for twenty-something cooks looking for user-friendly, affordable ways to navigate their kitchens. I keep coming back to this dish as a favorite standby. Though I'll forget all about it for a while, the moment I happen to have the ingredients on hand I'll put it together, and the first taste of garlicky goodness will make me want to eat it for a week straight (which, if you buy as many greens as I sometimes do, is what inevitably happens). Somehow the combination of olive oil and white beans makes the whole dish seem rich and creamy, but you can sprinkle on Parmesan cheese or even toss in fresh mozzarella. If you cut the greens pretty small, this makes a great topping for a bruschetta. And, if you're really not willing to venture into bean territory feel free to leave them out. The plain stewed greens are good on their own. 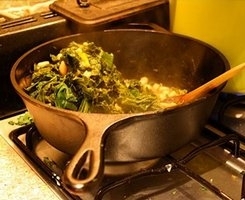 Warm the oil in a large cast iron pan over medium-low heat. Add the garlic and cook, stirring occasionally, until the slices are golden all over. Add the salt and cayenne and turn up the heat to to medium-high, then throw in all the greens. You may need to do this in more than one batch, putting in more greens as the previous batch wilts, so you don't overcrowd the pan. Add 1/4-1/2 cup of water or broth to keep the greens from sticking. Cook for about 15-25 minutes, until the greens are melt-in-your-mouth soft (if you're using chard or spinach, you probably only need to cook for 5-10 minutes). Drain the beans and add them, squeeze the lemon over the top, and heat through. Serve over pasta, with bread, or plain.